Barbecues and cookouts aren’t over for the year just yet. Is there a way for you to stay on track with your fitness goals without missing out on fun events? 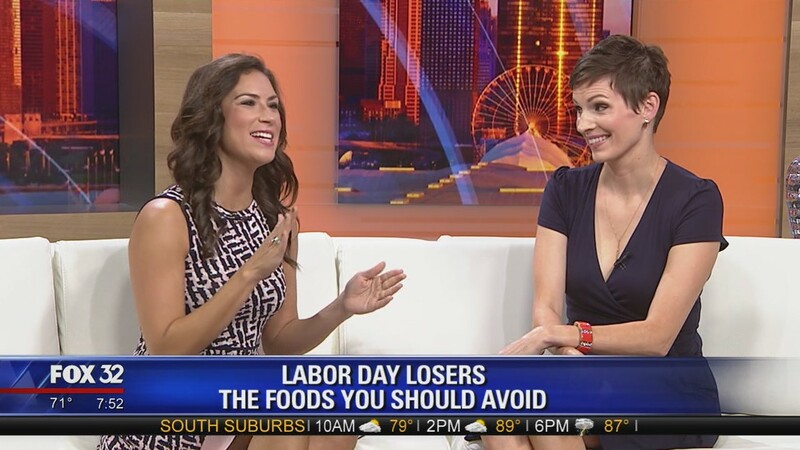 Weight Loss Coach and Fitness Expert Stephanie Mansour is back in action on Fox 32 to discuss five of the most fattening foods to avoid this Labor Day and what to reach for instead. These are sneaky food items, especially if they’re homemade because you have no control over how much of any one fattening ingredient has been added! Plus they won’t fill you up, so it’s much too easy to over-eat. I know those dips can be hard to turn down, but I have an alternative that is just as tasty and more nutrient-dense! Yum. I love how hummus pairs so well with veggies. Also, it’s made from chickpeas so it’s loaded up with healthy fats and protein! Loser = A fully loaded cheeseburger. You have several options here. You can opt for no bun and do a lettuce wrap, or just leave one bun. I always advise my private weight loss clients to pair their protein with veggies, so add a lot of lettuce to your open-faced sandwich and/or grab whatever other vegetables are available (maybe some from that hummus tray!). Much like the creamy dips, these can be sneaky about their ingredients, and pretty heavy on the calories while being low on the nutrients. People are getting pretty creative these days with their side dishes, so look for things like a carrot-cabbage slaw (one that isn’t heavy on the mayo), or a cucumber or tomato salad, etc. Loser = Those ever-popular fluffy cakes. Sheet cakes are purchased for just about every occasion these days, but that giant slice is not only loaded with fat, it’s got a hefty dose of sugar that will knock you for a loop! Best to just say no, but you can still have a dessert! Winner = A bite-sized brownie or a smaller cookie. Doing this simple swap is worth it. These sweet choices are around one third the calories of that wedge of cake. The margaritas, the daiquiris, the pina coladas, these are the big calorie, high-sugar offenders of the adult beverage barbecue scene! Winner = Sip instead on a refreshing wine cooler, half a glass of wine mixed with sparkling water. Choosing this route should keep you feeling good not only on the event day, but also the morning after!